Shake all ingredients with ice cubes. Pour unstrained into the serving glass. Rub a spent lemon half along the rim and then push it down into the drink along with a piece of one of the spent orange shells. Watching with all the 50's island dancers, Dorothy Lamour in a South Seas getup, and our two American gents Bob Hope and Bing Crosby put me in the mood for an Eastern Sour. I hit pause on the DVR and consulted my copy of Beachbum Berry Remixed. This is the perfect drink for this movie. We have a "South Seas" Tiki drink befitting the movie's location in South Pacific. The whiskey represents the two Americans Hope and Crosby who are sweet on Lamour throughout the entire movie (and not bashful about taking a drink when they can). 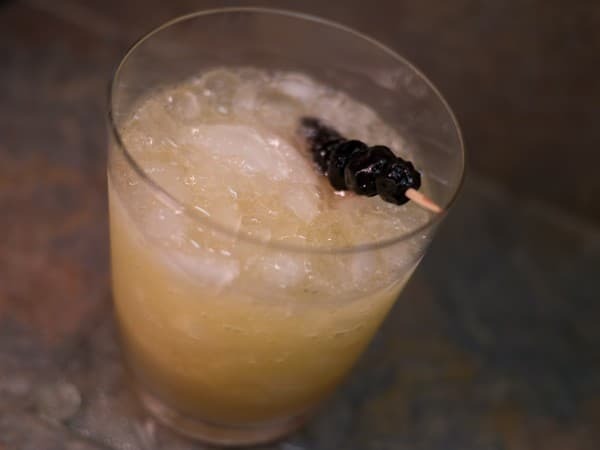 The Eastern Sour was invented by Trader Vic sometime in the 1950's. Though "East" in a drink name usually means the East Indies (such as an East India Cocktail), in this case it appears to be an homage to the east coast whiskey drinker with some Tiki elements thrown in. Instead of rum as the base spirit Trader Vic uses whiskey. And we have an exotic syrup (orgeat) along with the usual citrus. Rock candy syrup is specified in the original recipe. Here I am using rich gum syrup instead. Later two variations were developed using different base spirits. A London Sour uses Scotch instead of rye and a Munich Sour uses brandy. There is more orange juice in Trader Vic's recipe. I get "juiced" out by OJ for some reason so I usually cut back on it somewhat. That's just me - if you want to use the authentic amount use 2.5 oz of OJ. A 100 proof bourbon or rye works well in this drink to cut through the juices and syrups. You get a healthy dose of whiskey flavor and plenty of alcohol to keep this Sour from going flat. Shaking with refrigerator ice cubes or larger lumps works well. This gets you nice broken up ice in the finished drink. I tried using crushed ice in the shaker but this yielded a watery drink even with 100 proof whiskey. The prescribed garnish for an Eastern Sour is the spent shell from one of the lemon halves along with part of a spent orange shell. Of course, I had already thrown them away before I read that so I used boozy blueberries (I will have to get a recipe for them up on the site soon...).